This topic describes how to launch Native Client projects from the Tizen Studio, for testing purposes. You can test your Native Client (NaCl) application by launching it in the Google Chrome™ Web browser, on the TV emulator, or on a Samsung TV. If Google Chrome™ is installed on your computer, you can test NaCl projects in the browser. Build the project using the "Debug-pnacl" or "Release-pnacl" configuration, and make sure you generate a ".nexe" file for your computer's architecture. For more information about build configurations, see Building NaCl Projects. You must provide the main HTML file that loads the project's ".nmf" manifest file. To ensure that the manifest file is accessible, implement the main HTML file in the project root directory. To use the default launch configuration, in the "Project Explorer" view, right-click the project and select "Run As > Webpage in Chrome". The application's main HTML page is automatically detected from the project structure. 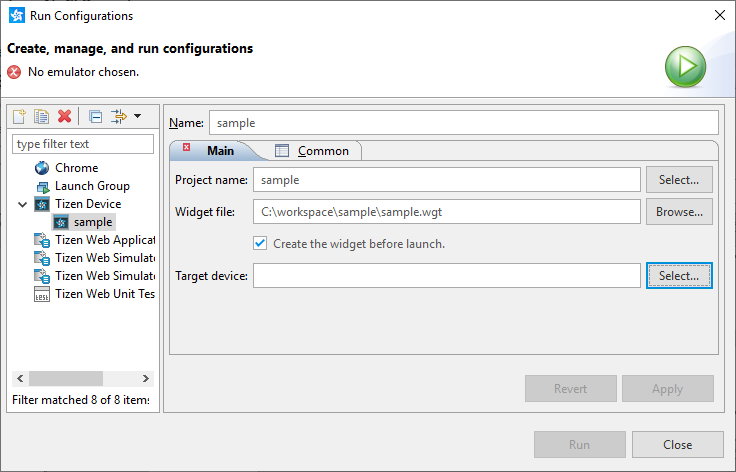 In the Tizen Studio menu, select "Run > Run Configurations". 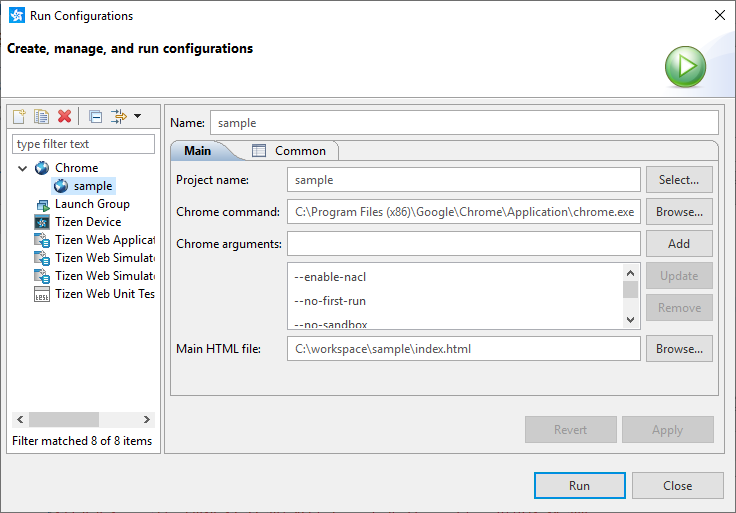 To create a Google Chrome™ launch configuration, in the side menu, double-click "Chrome". Enter the configuration name, project name, and main HTML file path. Check that the Chrome launch command is correct, or click "Browse" and select the Google Chrome™ executable file location. To add an argument, enter it in the "Chrome arguments" field, and click "Add". To modify an existing argument, select it from the list, modify it in the "Chrome arguments" field, and click "Update". To remove an argument, select it from the list, and click "Remove". To launch the application, click "Run". When you launch the application in Google Chrome™, a temporary HTTP server is created, serving files from the defined main HTML file location. The main HTML file is opened in a browser instance, using the defined launch arguments. A temporary user data directory is created for the browser. When the Google Chrome™ instance is closed, the temporary user data directory is automatically deleted and the temporary HTTP server is killed. To test the application on the emulator, build the project using the "Debug-pnacl" or "Release-pnacl" configuration, and make sure you generate a ".nexe" file for the i686 architecture. To test the application on a Samsung TV, build the project with the configuration you want, and make sure you generate a ".nexe" file for the ARMv7 architecture. Export the project as a ".wgt" file in the project directory. 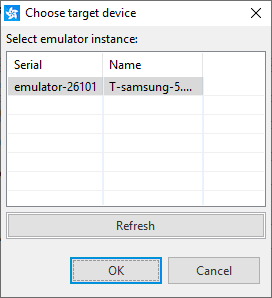 Launch an appropriate emulator instance, or connect the TV to the Tizen Studio. In the "Project Explorer" view, right-click the project and select "Run As > Widget on a Tizen device". In the Tizen Studio menu, select "Run As > Run Configurations > Tizen Device". To create a Tizen device launch configuration, in the side menu, double-click "Tizen Device". Define the configuration name, project name, and ".wgt" file path. To select the emulator instance or device to launch the application on, click "Select" next to the "Target device" box, and select the one you want. To install and launch the application on the emulator or TV, click "Run".